Old twins, new twins, famous twins, not-at-all-alike twins, side-byside twins, let's play twins, not-yet twins, mirror twins — all kinds of twins! — come together in a collection of original poems by two of our most celebrated authors for young people: J. Patrick Lewis and Jane Yolen. From a wave and a wink to a twin switcheroo, from a rocket to the moon to the old woman who lived in a shoe, these poems and mini facts, whimsically illustrated by Sophie Blackall, will leave even singletons with a twinkle in their eyes. Here is the perfect book to share with the twins in your life — and everyone who loves them. J. Patrick Lewis is the current Children’s Poet Laureate. A twin himself, he has written more than seventy children’s books, including Once Upon a Tomb: Gravely Humorous Verses. “Being a twin is the third best thing that has ever happened to me,” he says, “after having wonderful children and grandchildren of my own and eating my mom’s apple dumplings.” J. Patrick Lewis lives in Ohio. Jane Yolen, not a twin herself — but with multiple sets in her family — has written or edited more than three hundred books, including the poetry collections Switching on the Moon, illustrated by G. Brian Karas, and Here’s a Little Poem, illustrated by Polly Dunbar. She is also the author of the best-selling How Do Dinosaurs Say Good Night?, illustrated by Mark Teague. Jane Yolen divides her time between Massachusetts and Scotland. Sophie Blackall has illustrated numerous books, including Deborah Noyes’s Red Butterfly; Rukhsana Khan’s Big Red Lollipop, a New York Times Best Illustrated Children’s Book; and Annie Barrows’s best-selling Ivy and Bean series. Sophie Blackall lives in Brooklyn. We are not supposed to judge a book by its cover. But in this case, let’s do just that. The cover of the new poetry collection TAKE TWO!, with its twin toddlers bending upside down, polka-dotted tushies in the air, is quite possibly the cutest one to have crossed my desk in the run-up to spring. 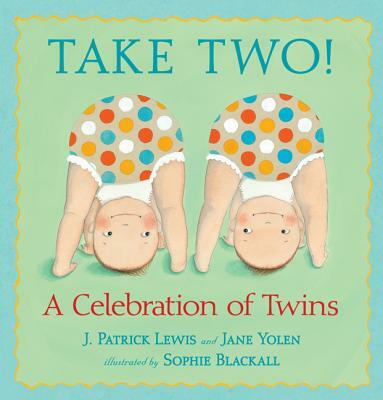 And since spring is baby season, at least for much of the animal kingdom, it seems an appropriate moment for this “Celebration of Twins” as the authors — J. Patrick Lewis and Jane Yolen, both accomplished poets — subtitle it…With its cheerily sweet and inventively varied illustrations by Sophie Blackall, TAKE TWO! has both a contemporary and a pleasingly timeless feel. This playful collection of twin-themed poems, a welcome addition to the bookshelf on the subject of twins, is as much for parents as for kids. From lighthearted to thoughtful, rhythmic to balladic, the verses are appealingly varied in mood and style. Whimsical and delightfully detailed, Blackall’s bright-hued watercolor, pencil, and collage illustrations depict charismatic youngsters and reflect each offering’s tone. A “Twin Fact” appears on each spread. A fine share-aloud for families with twins and kids who are curious about them. Veteran poets tap into the never-ending interest in twins with a collection of poetry dedicated to twosomes... Divided into four sections comprising “Twins in the Waiting Womb,” “Twinfants,” “How to Be One” and “Famous Twins,” the poems explore milestones as twins, the push and pull of twin relationships and the need for individuality... T-winsome. More than 40 original poems playfully present "twindom".